Live The Life You Have Imagined: Sunrises, Surf, and Sunsets! This is a routine you could definitely get into! 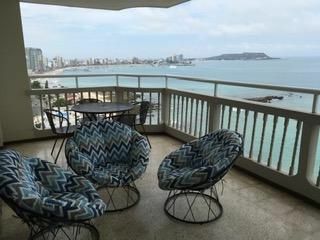 In the quiet, and very desirable San Lorenzo sector of Salinas, on a long stretch of sandy beach, you will find this three bedroom, three bathroom condo, with high-floor, spectacular views of Salinas Bay, Salinas Yacht Club, Chipipe Beach and beyond. This is the place to start your day with breakfast and coffee on your spacious balcony, listening to the waves break on the beach below, watch the pelicans and frigates begin their own day fishing the waters, until you are ready to make your way down to the ocean, literally steps from the lobby of your building. You can spend your morning beach combing, finding sea shells in the sand, or venturing further toward the point and exploring the tide pools among the rocks there. Later, as the sun begins to really show its strength, cool off with a dip in the sparkling pool where you can still marvel at the ocean view! When it is time to eat again, you could stroll to your choice of local restaurants, or return to your condo to prepare your meal in the roomy kitchen. As the sun begins to set, you can return to the pool area and enjoy a relaxing soak in the hot tub, or put your feet up on your balcony and watch nature’s colorful display as the sun sets beyond La Chocolatera. At the end of the day, you will be ready to sleep in one of the three bedrooms – go ahead and open the door in the master bedroom that accesses the balcony, and let the the gentle ocean breeze and the sound of the surf lull you to sleep. I have no doubt you will dream of repeating this day again and again! For a private viewing of this condo, please contact Lourdes at 099.449.5658 in Ecuador. You can also reach her at Lourdes@ieiecuador.net.